If we compare information with such a vital substance as blood in human body, then the mail flow of an organization constitutes its blood circulation system sustaining a healthy work rhythm of the entire organization. No wonder that this circulation system should be kept clean and smooth, ready for unforeseen stresses and convenient for routine tasks. Naturally, the heart of the system represented by the corporate Exchange Server should be optimized in terms of load and storage space. Due to the fact that files attached to messages occupy a lot of disk space and constitute a considerable traffic share, Exchange administrators are often forced to block certain attachments sent and received by corporate users. What is more, the company’s security policies and other regulations can prohibit transfer of certain file types via email. For instance, if employees have plenty of work with large-sized images, it makes sense to organize image file transfer via shared folders on a file server instead of loading resources of an Exchange server. A most evident first step for administrators would be to use Outlook group policies and to block unwanted file types, namely JPEG, TIFF, or GIF, on client level. However, if they block certain attachments on the level of Outlook by introduction of group policies, such files still occupy disk space on the mail server and use other resources such as search indexing engine, indirectly. This fact brings us to the conclusion that attachments must be blocked on Exchange-server level, not on separate endpoints. To do this, you can avail yourself of a specialized management solution called Attachment Save for Exchange. It is a two-component tool supporting Microsoft Exchange Server 2013, 2010, 2007, and 2003, as well as Microsoft Small Business Server 2011. The first component, Management Console, can be installed on any endpoint of the domain. On the server side, the job is done by a set of specialized transport agents integrated in the mail flow processing. A deployment wizard carefully ushers the user through all stages of installation on any number of corporate Exchange servers. 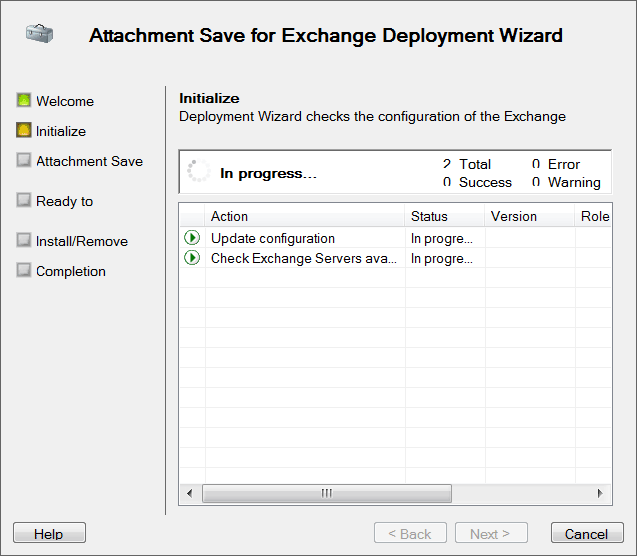 As soon as Attachment Save for Exchange Agent is installed on the server, you will be able to monitor its traffic and the overall application performance from the Console. The solution features a flexible system of rules with actions, conditions and exclusions. 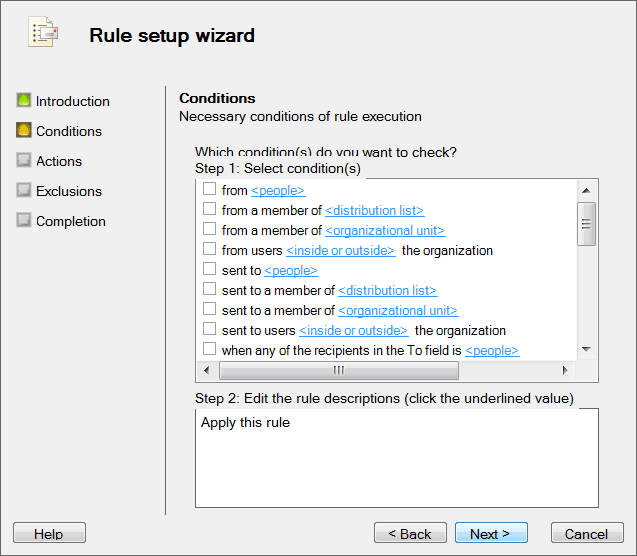 A rule is easily set up and edited in another wizard launched from the Management Console. As for blocking certain attachment types, Attachment Save for Exchange has a simple and clear-cut advantage: it can completely remove the attachment before it is placed in storage. In this event, it is possible to set up a notification of removal to be sent along with the message in order to inform users of the policy breach. By the way, notifications are fully customizable text files, so they can include any information you find relevant, such as policy reminders or instructions for further occurrences. For instance, when the Exchange server starts processing a message from the outside and detects an .exe file attached to it, the file is removed, but the message is still delivered with a notification. If it is preferable that the recipient gets the attachment next time, make sure that the sender’s address is listed in exclusions before he tries to resend the file. Moreover, you can opt for an advanced scenario and save certain attachments to a corporate file server. For example, if your company often receives financial documents in PDF format such files are saved to a dedicated folder on a file server where they are categorized by date, file name, or sender, and the addressee receives a link to the file in the message instead of the document itself. Thus, it is possible to save PDF files attached to messages titled ‘Annual Report’ to ‘Annual Reports 2000–’ folder, and each employee with access to this folder will be able to see the report, even if the recipient is away or forgot to forward the document to his colleagues. Centralized saving of attachments has many benefits including a wider range of storage and archiving options, saving disk space on workstations, and enhanced security. What is more, users can share access to these attachments by exchanging links, which decreases internal traffic. All in all, Attachment Save for Exchange is a powerful solution which can be of great assistance in optimizing corporate file transfer. You can block unwanted attachments with a few clicks, completely remove them, or save to a preferred destination within the domain. The process of deployment on server side is facilitated by a user-friendly Management Console, which can be run on any workstation of the company. Its fundamental difference from client-side attachment processing solutions is rooted in the fact that unwanted attachments are permanently deleted before they are saved to Exchange server, thus decreasing traffic and the load on the entire mail infrastructure. ← Outlook add-ins and Outlook Apps: who is who?